Costa Mesa Truck Accident Personal Injury Lawyers - Over 40 Years of Experience You Can Trust If You Have A Truck Accident, Car Accident Or Other Personal Injury Claim in Costa Mesa, Orange or Anywhere in California, Contact Our Personal Injury Lawyers for Costa Mesa, California! Our Costa Mesa truck accident injury lawyers and law firm offer dynamic and compassionate legal representation for the victims injured in a truck accident as well as family members of people killed in truck collision, involving 18 wheelers and big rig vehicles, for wrongful death claims in Costa Mesa, a city in Orange County, California. Our truck accident injury lawyers provide legal services not just in Costa Mesa, but in Irvine, Garden Grove, Newport Beach, Anaheim, Santa Ana, Orange County, Riverside, Los Angeles and any other place in California. Accidents involving trucks, large commercial vehicles and big rig vehicles in Costa Mesa, Orange County, California can be quite disastrous. 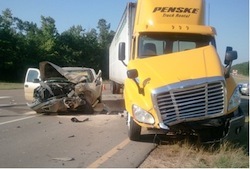 Due to their huge size, weight and force, truck crashes are often much worse than smaller car collisions or accidents. So, if you or a loved one has been in a truck crash, need legal services for a truck accident or car accident personal injury claim, wrong death claim or any other personal injury claim in Costa Mesa and anywhere in Southern California, we urge you to contact us for a FREE case evaluation and consultation. In fact, you can also get some quick general truck accident advice by visiting our Truck Accident Injury Advice Section. Costa Mesa has a population of about 109,960 and an area of 16 square miles, according to the 2010 U.S. Census. Costa Mesa is home to several institutions of higher learning that include Orange Coast College, Vanguard University, Whittier Law School and National University. Some cities that border Costa Mesa are Irvine, Newport Beach, Huntington Beach, Garden Grove, Tustin, and Westminster. The City is served by two (2) freeways, one is the state route 55 and the other is the San Diego (405) Freeway. Costa Mesa truck collision victims can have serious injuries, sometimes resulting in wrongful death claims. Preventive steps must be taken to avert truck accidents, for instance ensuring the truck drivers are well trained and that the trucks are carefully inspected before going on the road. Despite knowledge of the traffic rules and experience in truck handling, truck collisions and fatal crashes continue to occur. Negligence of the driver, including fatigue, and at times faulty maintenance (such as faulty brakes) and design by the truck manufacturing company are prominent causes of truck accident and fatal collisions in Costa Mesa. Issues with the truck's mechanics, such as transmissions, brakes, etc. We have over 40 years experience in successfully resolving thousands of truck accident and other automobile accident personal injury claims, premises liability claims and wrongful death claims in Costa Mesa, Orange County and throughout California. Our experienced and compassionate personal injury lawyers and law firm have recovered millions and millions of dollars for our injured clients. Our entire personal injury law firm concentrates in dealing with Personal Injury and Wrongful Death Claims – not divorces, probates or other matters. Truck Accident, Personal Injury & Wrongful Death Cases are what our lawyers handle! Do not hesitate to contact us at 1-866-465-8792 or 1-866-INJURY 2 or 818-222-3400 (after hours, press 1) for a FREE, no-obligation consultation and to learn how we can assist you further. On the other hand, you also can email us at info@WalchLaw.com or just use our easy contact form to tell us about your case. FREE Case Evaluation: Contingency Fee - NO Fee Until You WIN!